I adore the look of this, but wonder how long they would last. 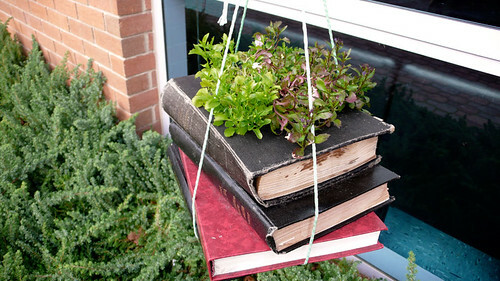 I don’t imagine books would take kindly to being watered. 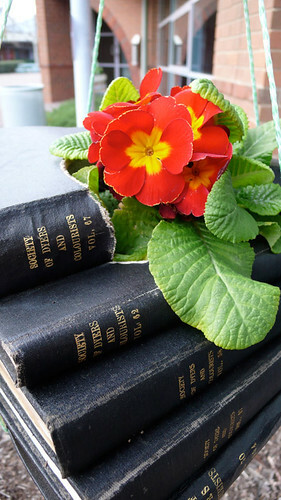 In fact, I have a list of book-related crafts that I haven’t tried yet, because the idea of ruining perfectly good books is a bit troubling for me. Taken at RMIT during a conference in Melbourne Australia (in 2008). 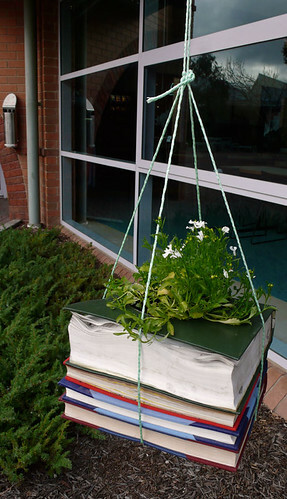 WOW…i’v never seen this before,i wouldnt have the heart to do it to any book in my collection. I even have trouble damaging catalogs and phone books. Bobbins and Balms, I know what you mean. It almost seems criminal to use books like this. They are so cute, but… but!! Oldfool, I’d be ok with re-using a phonebook since i rarely use them and they always show up on my doorstep! These are soo cute! I might not use my favorite books but Half Price Books has a great clearance section with books that would be perfect! ok then, i think i want to change a few lines from my comment Megan, i can destroy catalogues and phone books in this manner…but no to reading books. You’ve been awarded on my blog! check the link if you’re interested! You could always connect a great looking garden stake to a plant container and lift the plant out for watering time. Also, you can get books for $1 at your local Thrift shop that are very outdated. That way you are recycling something that would other wise be in a landfill and helping a charity at the same time.